To celebrate the 25th anniversary of the world’s most notable hedgehog, Honda showed a Sonic the Hedgehog-themed Civic at Comic-Con this year. But what people may not realize is the Sonic-Civic was actually just the latest in a long-running series of video game-themed cars to be shown at Comic-Con. And not all of them have been good. 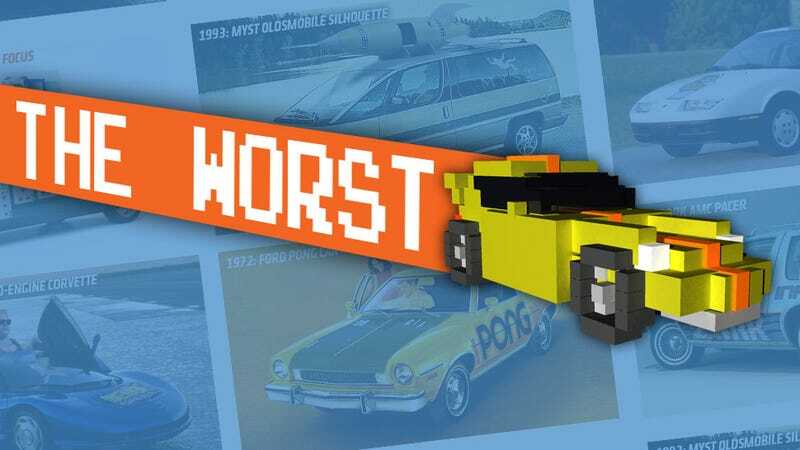 The very first video game-themed car was much earlier than you’d think, coming out right alongside the first really popular video game: Atari’s Pong. The Pongmobile, from 1972, was a Ford Pinto modified with a custom paint job and a five-inch black-and-white CRT in the dash upon which you could play Pong. The steering wheel actually controlled the player’s paddle (the passenger had a small knob on the glove box), but there was no way to shut the game off. That means as you drove, you were unwillingly playing a never-ending game of Pong, until the constant beeping drove you mad. In the early days of computer gaming, one of the most popular genres was the text adventure. Infocom was the biggest producer of these, and Zork was their biggest hit. These games sold well, because they could be ported to just about any system at all, But they didn’t really lend themselves well to exciting visuals. The 1980 AMC Pacer that Infocom customized for Comic-Con replaced the wood paneling with Zork’s trademark stone wall, and silk-screened notable passages from the game on the car’s windows. One of the Nintendo Entertainment System’s worst games also had one of the worst Comic-Con cars: a 1991 Saturn SL-1 with a giant set of foam-core ten commandment tablets on the roof. It was half-assed, through and through, and ended up abandoned in the lot behind the San Diego convention center after the show. Myst was a genuine phenomenon in the early 1990s, but when Comic-Con came to San Diego in 1993, it was about a month before the release of Myst, so hardly anyone really knew what the hell it was all about, or why a space-shuttle-looking van had a steampunk-looking rocket on the roof. In hindsight, the van was actually pretty cool, with that fiberglass rocket from the game on the roof and a small library inside the van with game-relevant sketchbooks and opulent interior decor. Sadly, the Myst Olds Silhouette has not been seen since 1995, and all I could find of it was this faded old press photo. Widely regarded as the lamest Comic-Con video game-themed car ever, Microsoft added some decals and a roof sign to a Ford Focus hatch to promote the free Solitaire application bundled with Windows 2000. A pair of LCD touch screens mounted where the rear quarter windows were supposed to let convention-goers play Solitaire right there on the car, but the PCs driving them were usually crashed. This might be the perfect matchup of famous vaporware: Duke Nukem Forever and the mid-engine Corvette. In 2003, 3D realms was hoping to re-kindle interest in the long-delayed game, and so decided to commission a car for Comic-Con. They used GM’s old 1990 concept car, the CERV III Corvette mid-engined ‘Research Corvette’, as the basis for their car. As part of an eight-month lease, they were permitted to make “non-permanent” additions and customizations to the car. 3D Realms had a fiberglass Duke Nukem built and mounted on the roof, appearing to be bursting out, and big logo decals were mounted on the hood and doors. It took the game eight more years to finally get released, but as of yet, there has not been a mid-engine ‘Vette sold to normal humans.